Perfect for sparking conversations about the golden age of movies and entertainment! Put some glitz and glamour into this favorite pastime with our Familiar Faces Bingo™ Game! 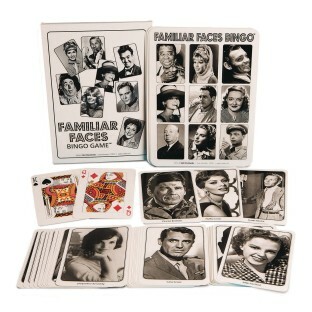 Perfect for sparking conversations about the golden age of movies and entertainment, this set features some of the most beloved and familiar faces your residents will enjoy walking down memory lane with. Set includes 12 different jumbo bingo boards measuring 9-1/2" x 13" that each feature 9 assorted black and white "Familiar Faces", a jumbo 5" x 7-1/4" deck of 52 calling cards that each feature a different "Familiar Face" and name on one side and then regular face playing cards on the other so you can use them as a jumbo deck of playing cards as well! Also includes an instruction sheet and storage box. Residents absolutely LOVED this fun game! Drummed up tons of stories and reminiscing conversation. And staff loved seeing all the fun old celebrities! Great item!